Oil on canvas, 36 x 59 cm. This study was painted during Skovgaard’s second trip to Italy, which he carried out with a fellow artist, Wilhelm Marstrand. Both had lost their spouses the previous year and one of the purposes of the trip was to recover, both mentally and physically. Skovgaard painted all day long outside in nature in front of his subjects. He moved from place to place with help from a local boy who carried his painting equipment. On a warm June day, Skovgaard sought refuge in the cool forest areas near Olevano, where this sketch was done. 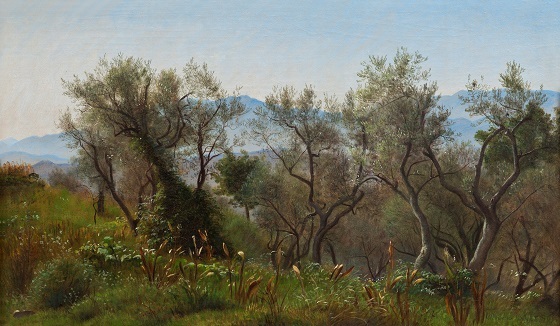 The area was a favoured destination for many Danish Golden Age painters at the time, particularly during the summer, when the heat and risk of disease in Rome became too great.